An instant view of your organizational health! 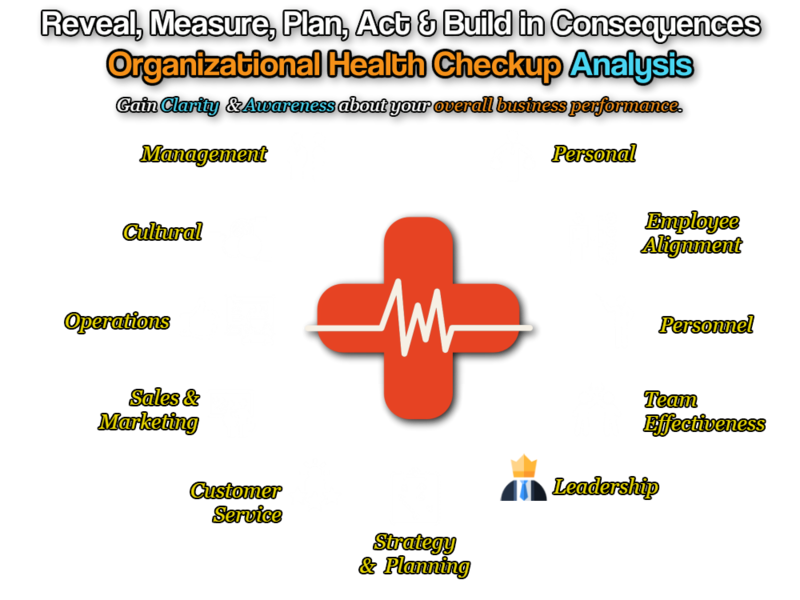 The Organizational Health Checkup (OHC) is a business diagnostic tool developed exclusively to help executives assess levels of overall performance in a controlled, accurate and effective way by measuring performance in eleven (11) core dimensions of business success. This holistic approach to understanding any business serves as the first step in identifying areas that require further investigation and development to achieve superior performance organization- wide. The Organizational Health Checkup often serves as the first step in helping you determine where energy needs to be focused, where the greatest potential for business improvements lie and where additional business diagnostics may be required to uncover and correct existing issues. Personal – how do the individuals in your organization feel? Employee Alignment – is everyone driving for results and profits? Sales & Marketing – does your pitch resonate and do your people sell? Cultural – how cohesive and beneficial is your culture? Management – how effectively do you manage things?